Silverstar Apartment @ Crown Imperial Court is a beautiful retreat in Cameron Highlands, located at the peak of Brinchang. Silverstar Apartment @ Crown Imperial Court offers three bedrooms, and two bathroom. Silverstar Apartment @ Crown Imperial Court is a wonderful place to relax after a long day of sightseeing and shopping. The apartment is fully furnished and has beautiful décor. You can view the amazing rolling hills, gold course and Brinchang town right outside your window and balcony. This quaint apartment accommodates 8 persons, internet access, parking, Astro satellite television, two single shower room, and two single bed and two queen beds. You definitely will not be disappointed will all the amenities this apartment has to offer. You also will not be disappointed with how close you are to all the wonderful attractions you are close to in Cameron Highlands. This is definitely a lodging accommodation to consider for your next vacation. You will be able to explore that awesome culture of Malaysia, the beautiful attractions, and have a nice safe place to sleep at night. You will love staying in this beautiful vacation rental and being close to all the wonderful attractions such as the many walking tails, Strawberry Farm, Cactus Valley, as well as all the amazing restaurant that Brinchang has to offer. Definitely consider staying at this lodging facility if you are traveling to Cameron Highlands. If you are looking for a beautiful three bedroom and one bathroom rental while visiting Cameron Highlands then definitely check out the beautiful holiday rentals at Silverstar Apartments @ Greenhill Resort. These beautifully decorated apartments sleeps up to eight people and provide amazing amenities. Located near the wonderful Tanah Rata town you will have the same comforts that you have at home. You will love going out to explore the beautiful landscape and coming home to your amazing cool air rental. Other amenities that this rental provides is free wifi and satellite television. Silverstar Apartments @ Greenhill Resort living room provides amazing comfort and is very well furnished with beautiful décor and comfortable seating. 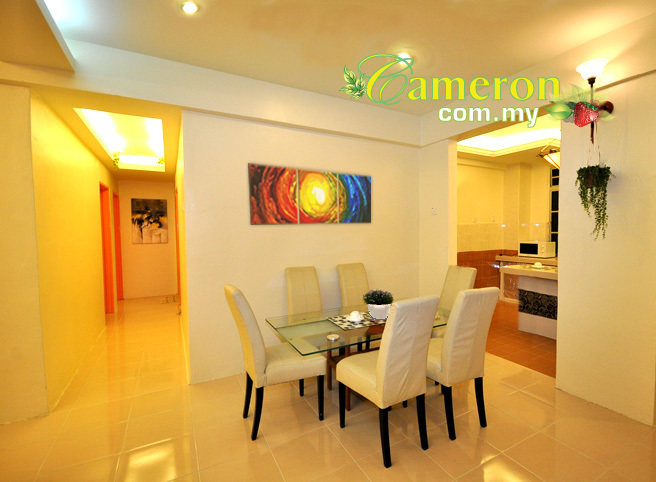 These apartments provide you an amazing panoramic view of the beautiful lush green valleys of Cameron Highlands. There are a wonderful halal restaurants, western, chinese restaurants and wonderful steamboats in Tanah Rata town. Staying at the Silverstar Apartments @ Greenhill Resort definitely allows you to have a great trip and a wonderful place to relax. With the wonderful apartments and beautiful scenery this is definitely an accommodation that is recommend for your stay to Cameron Highlands. The kitchen offers guests a microwave, refrigerator, electric kettle, silverware, and dishes to ensure that guests have an opportunity to cook the amazing produce they buy while visiting the city. Each room is equipped with local tea to ensure every guests gets to try out all the amazing tea the city has to offer. Silverstar @ Greenhill Resort is surrounded by the beautiful rolling hills of Cameron Highlands offering you an incredible view. Silverstar @ Greenhill Resort definitely is a great place to stay and rest during your amazing vacation. You will be so close to all the amazing activities in Cameron Highlands that you will definitely find it beneficial to stay at this lodging facility.